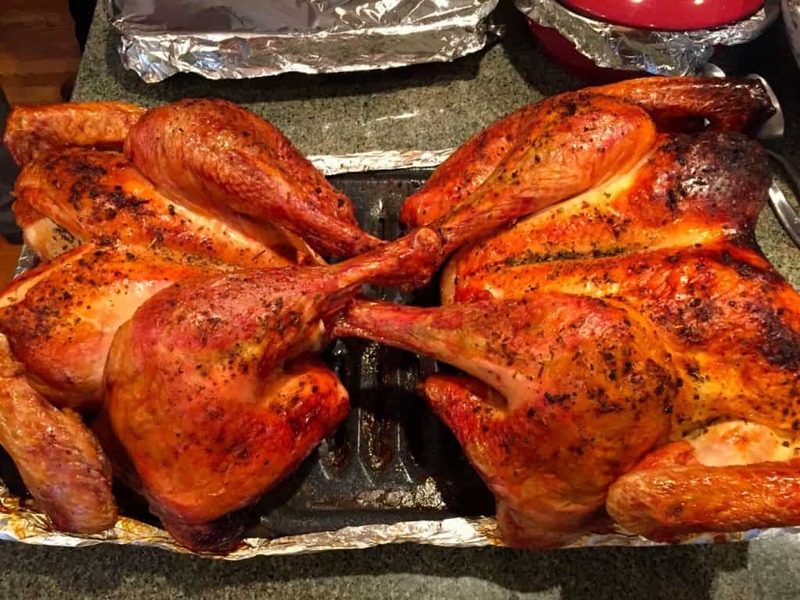 How To Cook A Butterflied Turkey - Maybe Even Two! Thanksgiving was just a week or two ago, and here is my obligatory turkey post. But just one turkey won’t do. Since we host about 25 people for dinner each year, we go for two turkeys. At the same time. And as far as I am concerned, there’s only one way to get that job done. Very similar to roasting a butterflied chicken, learning how to cook a butterflied turkey is the solution! It produces a beautiful bird, delicious crispy skin and cooks in only about two or two and a half hours, depending upon how large your bird is, or birds are. Two and a half hours! That’s so much quicker than so many old school recipes that want you to cook for a certain amount of time per pound blah blah blah. Just cut the back out, crack it open and cook it up! Making sure you have the correct ingredients is a whole lot easier when you don’t have very many to work with in your recipe! Over the years, I have found a few shortcuts to make this as close to fail-proof as possible. First, work with a butcher when choosing your turkey. Or I guess a farmer would work as well, but I don’t happen to have a turkey farmer on my speed dial. But the guys at Whole Foods do know me pretty well, so when I ask for them to cut the back out of my turkey, and save it for me, they are more than happy to do so. Butterflying your turkey, and actually doing the hard work of cutting the backbone out of a 16 pound turkey is tougher than it may sound. For years I cut it myself, and never once enjoyed even a second of the process. The turkey is likely to be close to freezing, and the bones are so much bigger than a chicken’s, that even with a pretty substantial pair of steel kitchen shears, it was tough sledding. One of my brothers even broke a rib one year during the process by over-exerting himself! I’ve learned my lesson, and each year, when I order my turkey, I make sure to include directions for the butchers to butterfly the turkey for me. And while I’m at the store, ordering or picking up my turkey, I make sure to grab one of the brine kits that will undoubtedly be for sale. 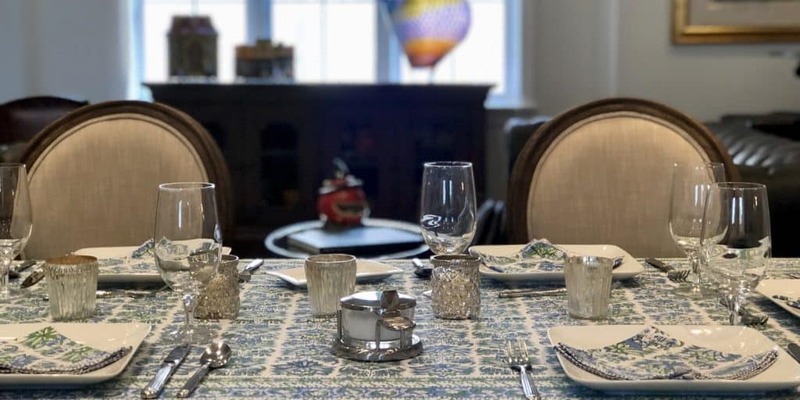 When choosing between brine kits, I try to ensure that the spices used are non-GMO and organic if possible, such as the one offered by Urban Accents. 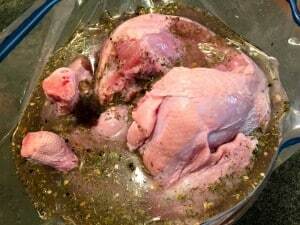 Brining is a must in my kitchen when Thanksgiving rolls around each year. For one thing, it gets me organized to make sure my turkeys are prepped and ready to go, a full day ahead of time. Secondly, the end result is totally worth the extra effort, brining makes it so much harder to overcook the turkey, and also fills the bird, and house, with all sorts of wonderful flavors and smells. It’s a total necessity. But which bird to use? Organic vs Free Range? Heritage vs Conventional? Oh my goodness, there are so many choices. And prices. Have you seen how much an heirloom variety turkey costs? 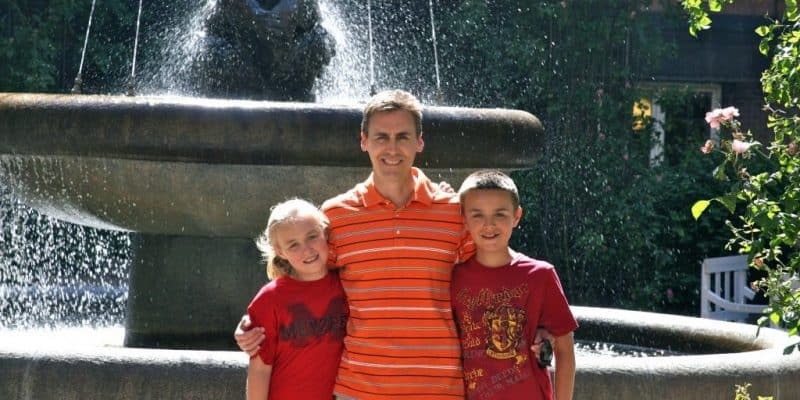 I love my family, and I enjoy hosting Thanksgiving, but I just can’t justify spending several hundred dollars on the turkey alone, before buying any other groceries, to make sure that one night of the year we have an ancient variety of turkey that has lived on nothing but green pastures and native woodlands eating nothing but the most appropriate and natural feed available to our native wildlife. Instead, I usually go with an organic bird, simply to try and minimize the presence of herbicides and GMOs at the dinner table. But I also recognize that even when I order an organic turkey, I am likely to receive a bird that has been fed a fair amount of corn and other grains for it’s diet, so it might not be the most pristine choice, but it’s what works for me. At least one day before serving, make sure to thaw turkey if frozen. 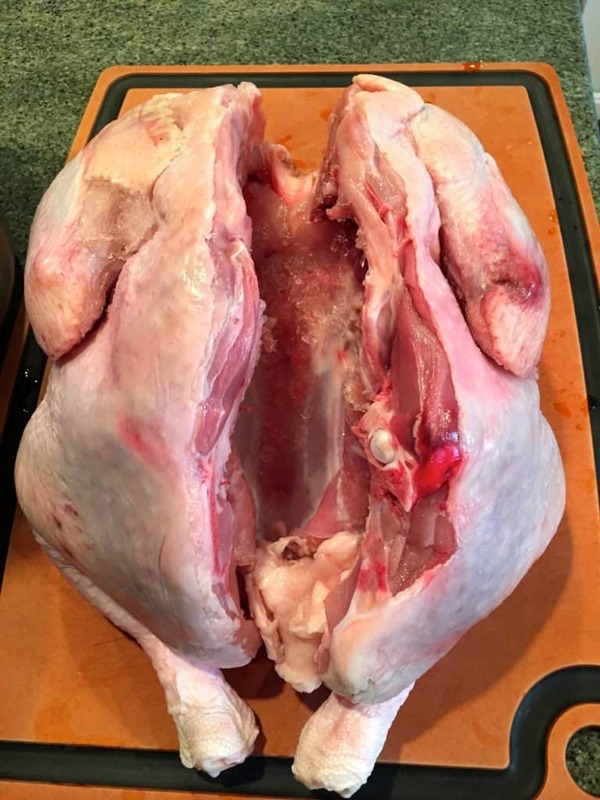 Either have your butcher cut the backbone out, or get out your heavy duty shears and cut up and down the spine and remove the backbone from the turkey and set aside for stock. Place turkey on back down and breast up, and lean in hard on the breast bone and press the turkey down until you crack the keel bone and the turkey is pretty flat, with the legs and breasts now about the same height. Prepare the brine in a large pot or in a storage bag large enough for a turkey, or two. Then place the turkey into the brine and refrigerate overnight. Ideally the entire bird is submerged in the brine. About five hours before you want to serve your Thanksgiving turkey, remove it from the fridge and brine, then rinse under cool water in the sink to remove any extra salt and spices that might be hanging on. About four hours before you want to serve your butterflied turkey, preheat the oven to 450 degrees. If preparing just one turkey, find your broiler plate and place your turkey on it, with the legs all squished up next to the breast meat. 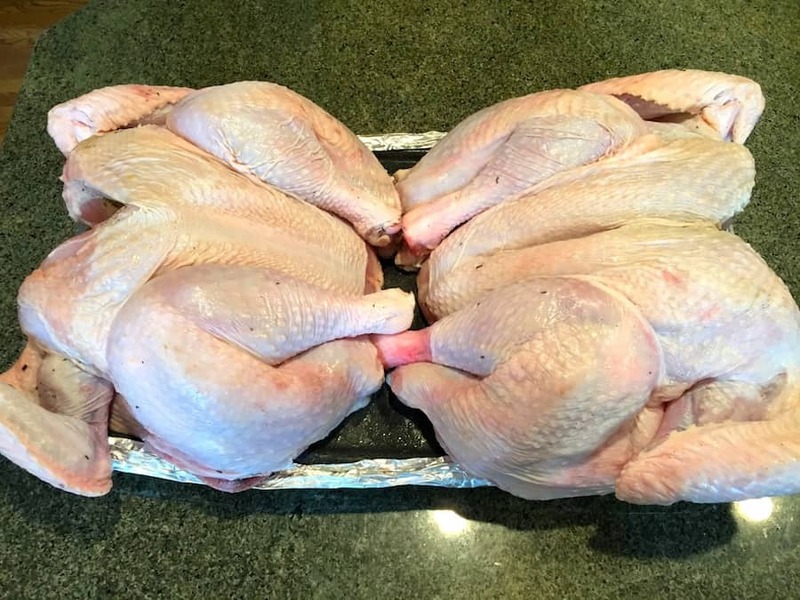 If preparing two turkeys, like me, you may need to use two broiler pan tops and piece them together over one bottom. 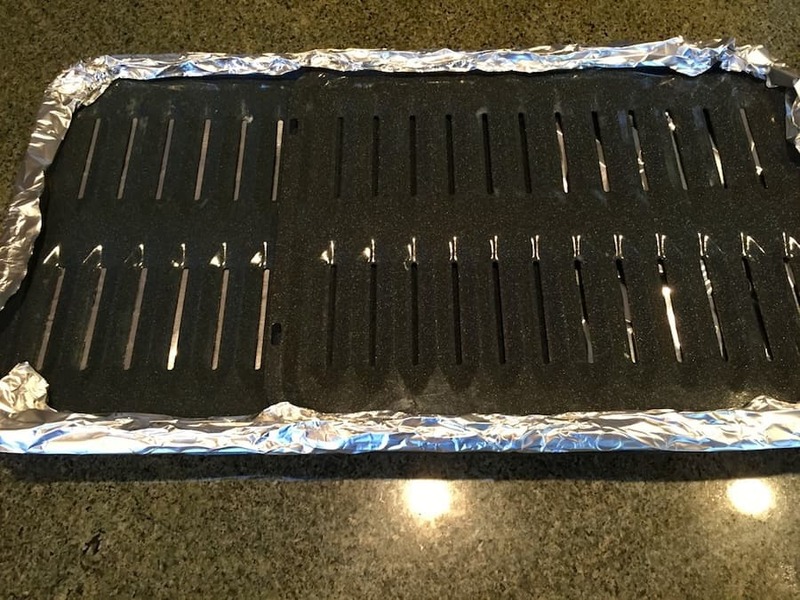 Wrap the two tops together with aluminum foil and then poke some holes in the foil to allow the fat to drip through, making sure to only cut holes in the aluminum foil above the pan so that you don’t have drippings on the bottom of your oven. Pour about a cup of water into your broiler pan, that will help make sure that the grease and fat that drip through during cooking don’t smoke up your kitchen. Insert an oven thermometer into the breast of your turkey, and cook at 450 until it registers 160 on the thermometer. 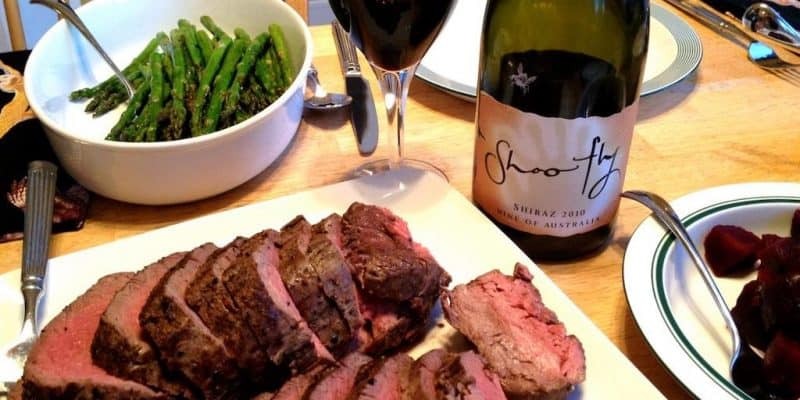 Remove from the oven and let sit for about 20-30 minutes, and then carve and serve.